Tvedalite: Mineral information, data and localities. Named after its discovery locality, Vevja quarry, Tvedalen area, Vestfold, Norway. 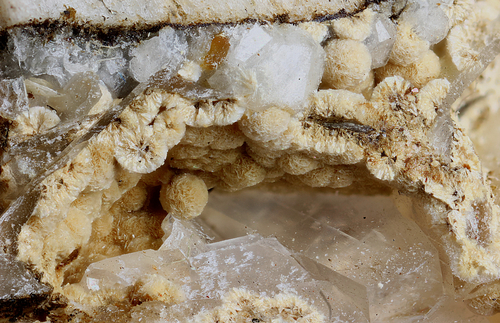 May belong to the Zeolite Group (uncertain since crystal structure has not been determined yet). Spherulites up to 3 mm in diameter composed of densely packed, radially oriented platelets (a few μ in length). The spherulites are overgrown by a crust of chiavennite. Chiavennite 3 photos of Tvedalite associated with Chiavennite on mindat.org. Analcime 3 photos of Tvedalite associated with Analcime on mindat.org. Aegirine 1 photo of Tvedalite associated with Aegirine on mindat.org. Larsen, A. O., Åsheim, A., Raade, G. & Taftø, J. (1992): Tvedalite, (Ca,Mn)4Be3Si6O17(OH)4•H2O, a new mineral from syenite pegmatite in the Oslo Region, Norway. 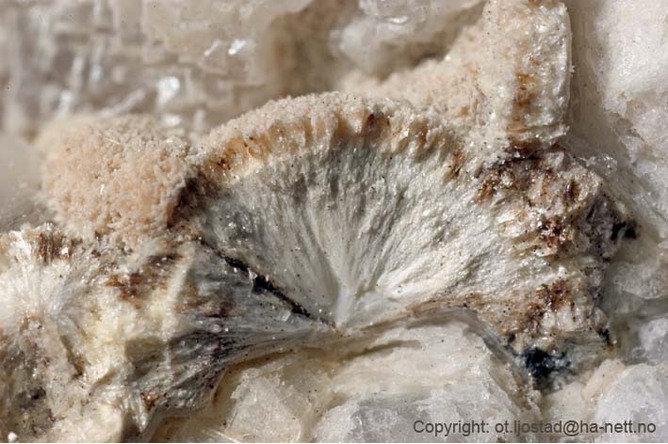 American Mineralogist: 77: 438-443. Grice, J. D., Kristiansen, R., Friis, H., Rowe, R., Poirier, G.G., Selbekk, R.S., Cooper, M.A. & Larsen, A.O. 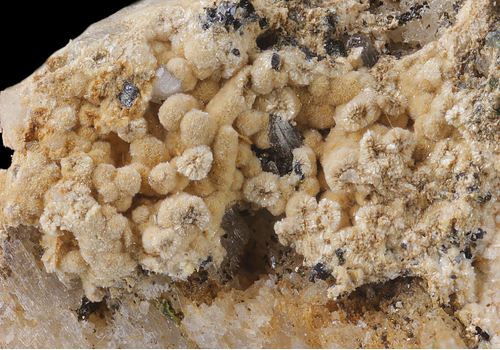 (2013): Ferrochiavennite, a new beryllium silicate zeolite from syenite pegmatites in the Larvik Plutonic Complex, Oslo region, Southern Norway. Canadian Mineralogist. 51, 286.